I finally packed it in at 6:30 p.m. after an all day marathon. The basting paid off, I’m super happy with the back of the quilt as well as the front. So far this project has eaten an entire spool of Aurifil 50wt thread (piecing & free motion quilting), I don’t know how many times I changed the bobbin, I lost count. I also broke one needle when the thread got stuck. No doubt I’ll sleep like a rock tonight, I’m bushed! How was your day?? 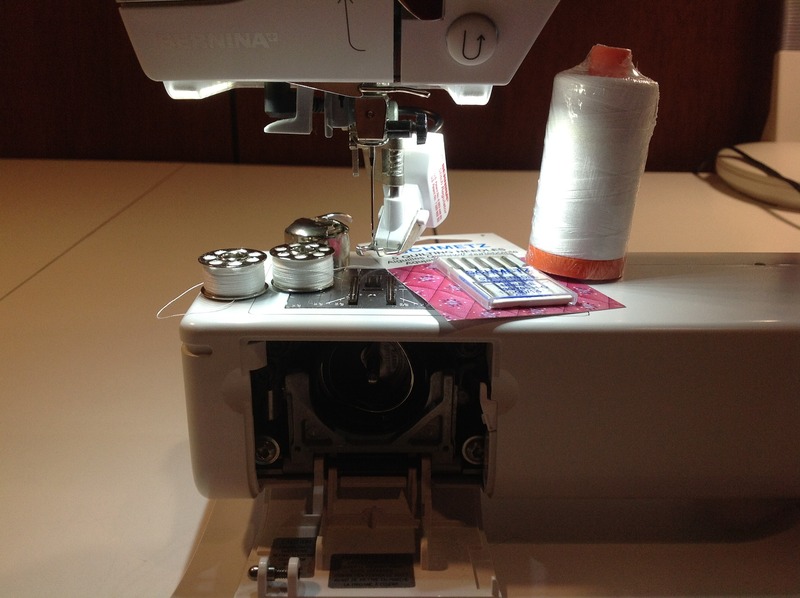 This entry was posted in FMQ, Quilting, sewing notions and tagged Aurifil thread, basting, bobbin, free motion quilting, Schmetz by Tabatha. Bookmark the permalink. Wow, your quilting looks beautiful! And you did a super job of lining up the strip of chevrons on the back with the one on the front…I have never been that careful about alignment of front and back, but I know how challenging it would be to do what you have done here — congratulations!! You deserve a very peaceful night’s sleep. Thanks Jennifer! It’s a lot of work but so satisfying in the end! 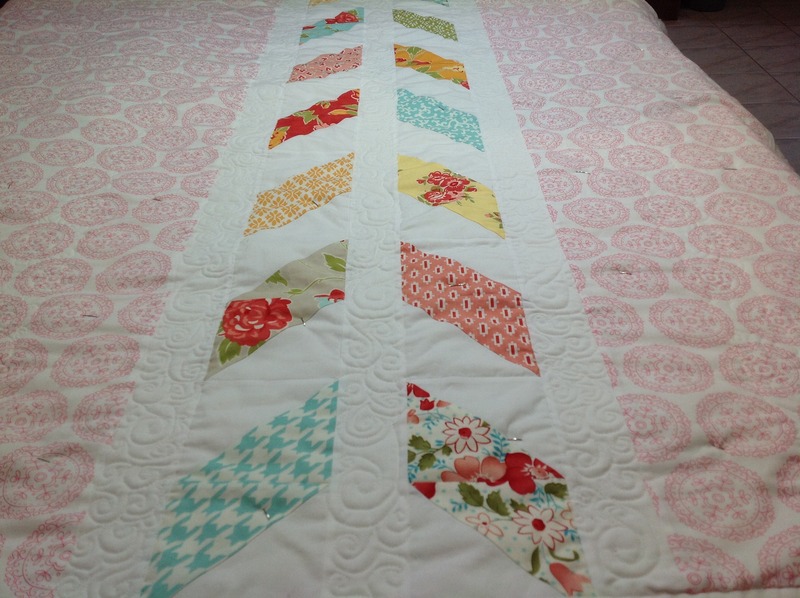 Your quilting is beautiful ! I can’t believe you did it all on your sewing machine. Have a good nights sleep you deserve it!!!!!!!!! I can’t believe it either Pamela! This is the first time I’ve quilted a quilt like this, it was easier than I thought. I’ve done straight line quilting which is also a struggle with a domestic machine. The space between the needle and the arm on this machine isn’t very big. Thanks for stopping by! That looks great! Your FMQ is amazing. 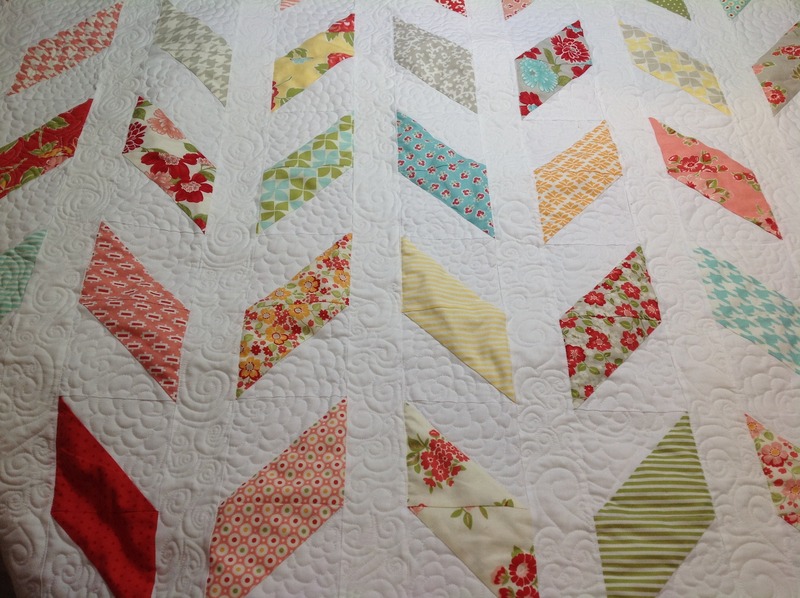 Your quilt is lovely and your FMQ is amazing! is the free motion quilt still available? My daughter is expecting a little girl in January and loves this pattern and would like it in teal coral and yellow.